Do you need to check and summarize various budgeting to a consolidated financial plan? Across several departments? The Budget-Tool is the solution for you! Many companies and governments use either SAP or Excel tables for financial plans so far. The use of SAP for each individual user, however, is expensive because each user needs a separate license. The use of Excel tables on the other hand carries some risk, because the error rate is high, just one incorrect formula and the calculations are no longer correct. The consolidation is time-consuming. With the Budget-Tool we provide you a cost effective and above all simple solution! 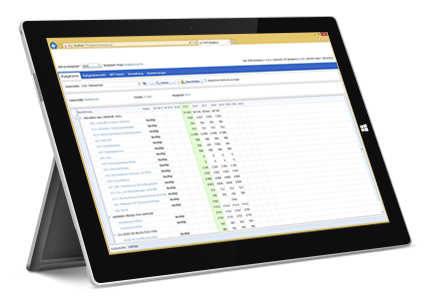 In the Budget-Tool, the various budgeting can be entered by each user, checked, approved and transferred at the push of a button into the SAP-system. The Budget-Tool can also be used as a stand-alone solution. The budget tool is the ideal tool for everyone who wants to create financial plans across departments – contact us for more information!